Today I am super excited to be showing you these VELCRO® Brand Holiday Ties that are shaped like little hearts! I had never seen any ties like this before I saw these from VELCRO® Brand products. I think these are so SO adorable. I was given a few to review, so I decided this little gift box needed a makeover for Valentines. 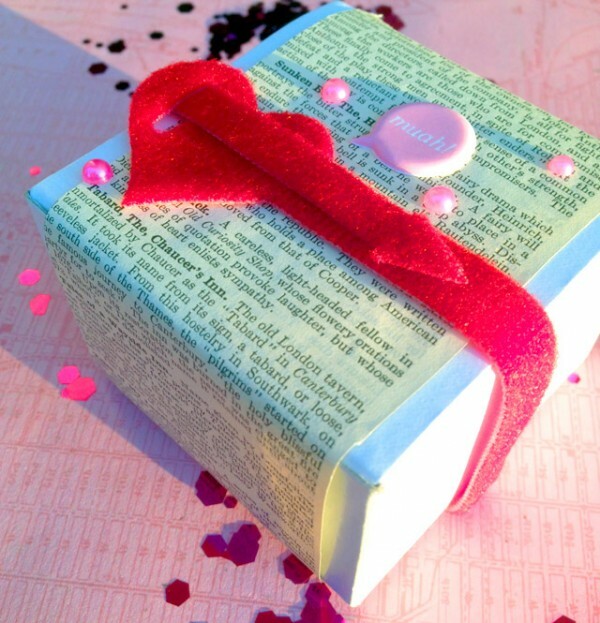 I wrapped a piece of old book paper around it, added a few stickers and then wrapped a VELCRO® Brand Holiday Tie Heart around it. Now, we all know that VELCRO® Brand products are pretty genius, but these are cute and genius- Not only do they secure the gift box but they add extra embellishment as well! To use them, you just wrap the tie around whatever it is you want to secure, and then pull the skinny end through the slot of the heart and pull it snugly and secure it to itself. Of course these ties can also be used around the house. Sure, they’re cute but if you’d rather use them to hold some computer cords together, that works too. I have some extra ties so I will probably be using a couple of them for around the house things! I also have a giveaway for you guys! If you would like to win a VELCRO® Brand product package give-a-way, then just comment below with your name and email address and letting me know what you’d use some VELCRO® Brand Holiday Ties for! Hi, I would love to have some Velcro gift ties. I would use them to tie up the boxes I made for the grand kids and use some to tie up some cords to get them out of the way. Thanks for a chance. Leave it to this company to come up with something so cute! I love Velcro. I bet they make Christmas trees, bunnies etc. How fun! I love velcro, making it easy for young and old alike. I am going on a cruise shortly and it would be great to put on all my baggage so it is easily identifiable. Liked the computer cord idea, but too cute for that! Wow. I use velcro for a lot of things, but I haven’t seen shape closures like these hearts. I have a tall plant that cannot stand on its own. I put a tomato cage around it but I have to tie the cage to the “trunk” of the plant. Using a red heart tie would be eye catching and look like a decoration, unlike the twist tie that is on there now. These are so adorable, I could see my daughter using it as a hair tie. Oh my goodness! That is so cute! I would love to use these for my Valentines gifts for my kids. They would love it! Thank you for the wonderful giveaway. I’m not sure what I would use them for right now, but when the time came I would love to try them! These would be so handy to organize all kinds of cords! Especially laptop and phone charging cords since you often need to lengthen and shorten them! Love this! It’s so simple and great for just about any occasion. I would use them to color code the bins in my son’s bedroom, even changing them for different holidays! I would love to use them in my sensory center of my structured learning class. I know my students would love to explore and use them in many ways. Thank you for the opportunity. I will be using the ties in my flower arrangements. 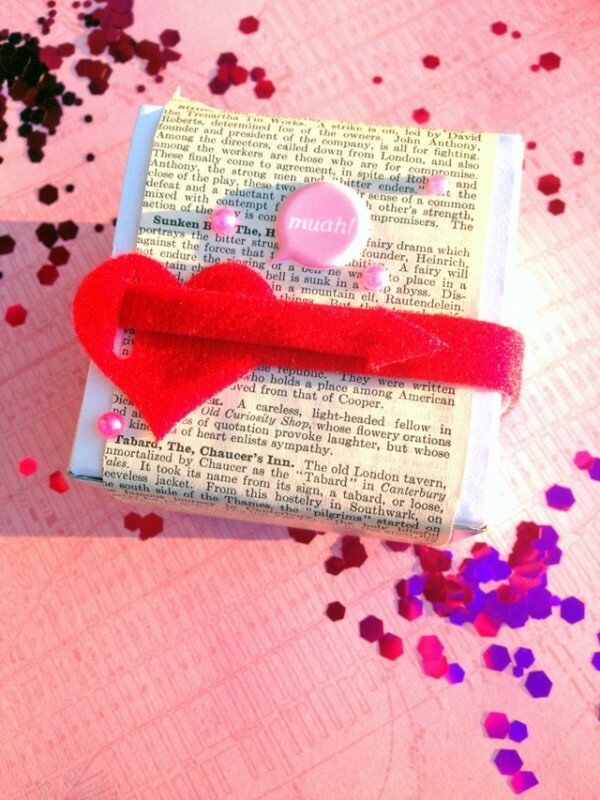 Those are perfect for wrapping around boxes of Chocolates or for Valentines! No wrapping required!